Following up on my introductory post about Birmingham's Fashion icon The Bull, I'd like to find out in today's post who is the designer behind his gorgeous outfits. Someone as famous and well known as the Bull can’t just quickly drop into the Bullring for shopping and ignore fans and admirers from all over the world. Totally understandable, that the bull has his own stylist for custom-made clothes. Did you know that a winter jumper, knitted by Stitches and Hos, was made from 14kg of wool and 12 people were involved in putting the jumper on him? I was curious and interviewed talented designer Kate Unwin, who created the recent Christmas wear and several other styles for the bull. Here’s the full interview. Q: What was your reaction when you were asked to design an outfit for the bull? K: I was initially asked to come and interview for the outfit before the Christmas bull and was offered the job. They mentioned in the interview that the Christmas bull was also on the cards. I was really excited to be creating an outfit for such an icon but aware it would be challenging! Q: How different is it to design an outfit for a 6-tonne sculpture in contrast to dressing people? K: I do a lot of jobs like this which involve lots of problem-solving and designing from scratch with no prior specific experience. I began by taking a lot of measurements and photos, I used these to make a calico toile and did my first fitting on the bull. This was then cut, pinned and marked to get the fit perfect. I used this edited toile as a pattern for the final garment with the chosen fabrics. I then did two more fittings to make sure the fit and placing of details was right. It was very difficult! He is a very odd shape! Also both sides are very different and he is just very large. When I made him a faux leather jacket it was very heavy and difficult to manoeuvre through the machine. Also the materials and processes need to endure the elements and still look good three weeks after I've installed them. All fittings needed to take place before 7 a.m. and as it was winter it was very cold and a couple of times raining heavily. I have to take a ladder to reach his head and get the garments over the top of him. Also there are people who want to talk to you at 5 a.m. in the morning that you'd prefer left one alone! Q: Have you had different designs in mind for the bull? K: The brief from the Bullring shopping centre was a Christmas jumper. I thought of what you might wear with your Christmas jumper on Christmas Day and thought of jeans and a paper hat out of a cracker. I sketched it out and emailed it over to the client. They were happy so I went ahead. 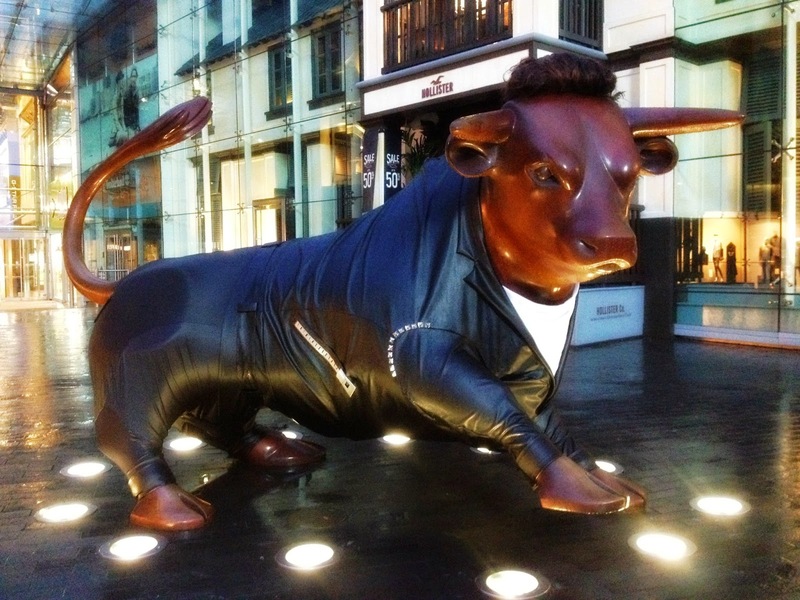 Q: Do you see the bull as a fashion icon for Birmingham? K: I think he might have started on a fashion journey... 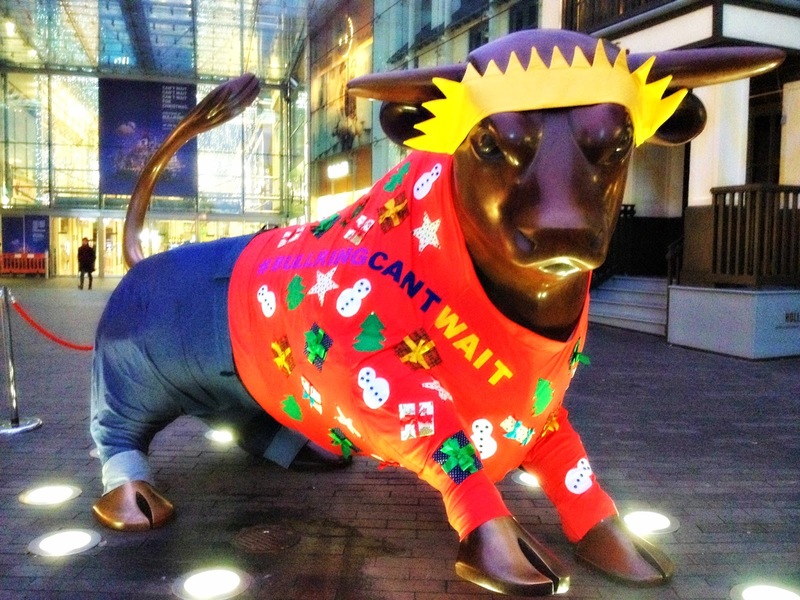 I think the Christmas bull is the first outfit which is referencing current trends and reflecting the shoppers who use the Bullring. Q: What do you think would suit him and what sort of style would you like to see him in? K: I think he looks good in jackets, the leather jacket suited him very well. Skintight trousers look pretty good as well. He is a strong, powerful figure and I'd like the opportunity to emphasise his best qualities. Thank you so much for reading today's post and I hope you've enjoyed the interview with Kate. Have you met the bull yet or have you seen him in any of his outfits? Images supplied by Kate Unwin. Thank you so much for the interview!